For the past few months, we’ve been busy adapting to our new office and new starting point at Týnská 7, but it’s already feeling like home. For anyone thinking of coming on our tours in the future, this is where you’ll find your guides waiting and where your tour will leave from, our ticket centre Prague Trips & Tickets in the historic Old Town of Prague. Prague Trips & Tickets is also your one-stop shop for tourist information, theatre, opera and ballet tickets, excursions within and outside Prague, airport transfers and even specialist activities like skydiving, cycling tours or learning to fly a plane over Prague! One of the fascinating things about moving to the new office though has been learning about the building itself and finding out what else lies round about. Týnská 7 is not perhaps your usual ‘shopping mall’ but you will find a variety of shops and services available here, with the advantage that it’s in a quiet location and a beautiful historic building. So we thought it might be interesting to meet our neighbours, see what else is going on in Týnská 7, and have a look at the history of our new home as well. 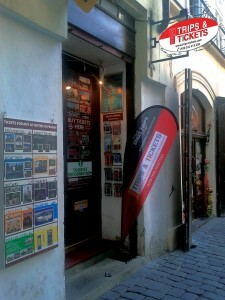 Prague Trips & Tickets is flanked by two remarkable shops. 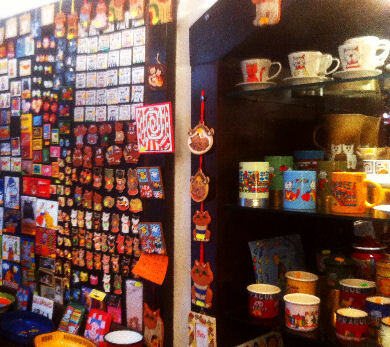 Firstly there is the wonderful Cat Gallery, where you can buy anything and everything cat-related, from jewellery to t shirts to housewares, all dedicated to our feline friends. 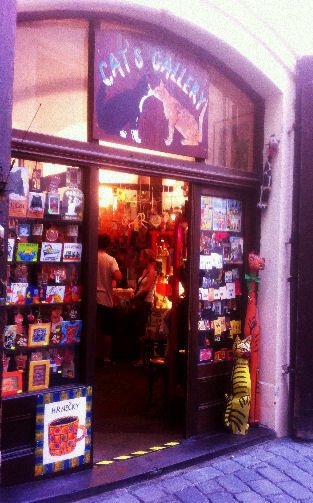 The shop opened in 2002, when the owners decided their collection of cat memorabilia might appeal to other cat lovers in the world. The shop is packed with kitty-themed goods and the staff are extremely friendly. English is spoken, though mostly about cats! 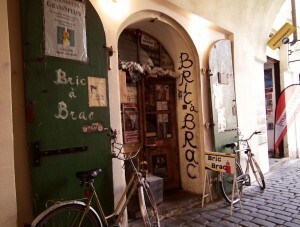 Our other neighbour is Prague’s famous Bric a Brac antiques shop, which has been in business now for nearly 20 years. Beginning as a handmade clothing shop, Bric a Brac evolved into selling collectibles of every kind and is a treasure trove of antiques and ephemera. You’ll find everything there from antique uniforms to old toys to bikes and old typewriters, split between the smaller boutique next to Trips & Tickets and a larger shop in the courtyard of the Týnská 7 building. Besides the shops, our building is also home to restaurants and cafes, including the Pizzeria U Budovce, named after Budovec of Budova, a Czech lord who once lived in the building (more details on him later in the article). 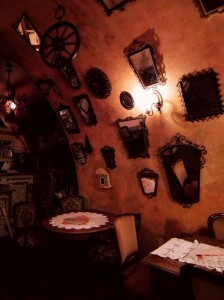 The pizzeria has a unique style of décor and a very intimate setting, and serves a wide variety of Italian food and cocktails. In the courtyard you’ll also find a hair salon, Salon Dan, and the building even has its own art gallery, Galerie Ajax, which displays and sells a variety of modern and traditional style paintings. It may not have the 200 shops that the nearby Palladium Shopping Centre boasts, but what makes Týnská 7 interesting as a ‘shopping mall’ is the unique character of the shops, the quiet atmosphere you have for browsing, and the beautiful historic setting, so if you are after some original souvenirs to take home, or just fancy some shopping that doesn’t involve all the usual big name stores, why not take a stroll down our cobbled lane and see what the building has to offer? But we are a tour company and so what fascinated us about moving to this building was its connection with Prague’s past. Týnská 7 was originally built during the reign of Charles IV in the 1300s, around the same time as St Vitus’ Cathedral, the Charles Bridge and nearby Church of our Lady Before Tyn were also under construction. The building was intended as a family home and had several owners before, in 1617, it was purchased by Václav Budovec of Budov. 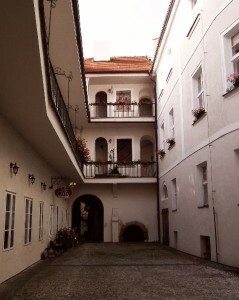 Budovec used this as his town residence whilst his family also owned a castle in Budov, near Karlovy Vary. The year Budovec purchased the house, 1617, saw the election of a new king of Bohemia, Ferdinand II, who was to succeed his cousin, King Matthias. Matthias had already taken the crown of Bohemia from his brother Rudolf II, whom those of you who’ve taken the Prague Castle After Dark tour will have heard a lot about! The problem was though that Matthias was already elderly and childless when he forced Rudolf to give up the throne, and so a new king had to be elected. 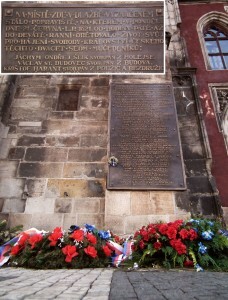 Whereas Matthias and Rudolf had granted a lot of rights and freedoms to the people of Prague, particularly when it came to religious freedom, Ferdinand was known to be a supporter of the Catholic counter reformation and so many Protestants in particular were concerned that his rule would bring about a new wave of religious oppression and persecution. The first sign, for the Protestants, that things were not going well was in 1618, when Ferdinand decided to shut down construction of some Protestant chapels on the royal lands. 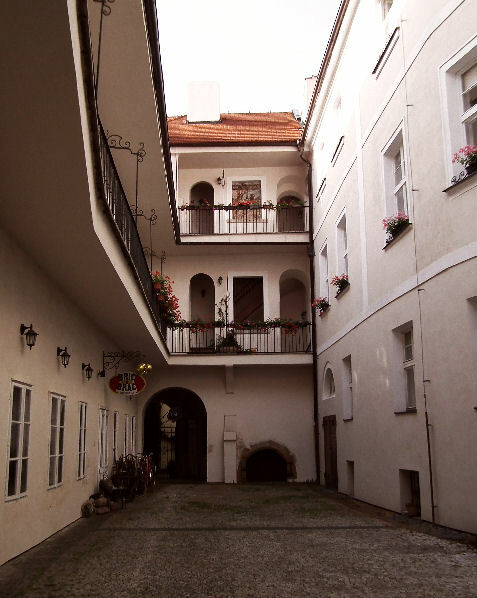 Protestants, led by Count Von Thurn, went to Prague Castle to confront Ferdinand’s men, and in the argument that ensued, two of the king’s officials and their secretary were thrown from a third floor window into the Deer Moat below. They survived the fall, and the secretary was even given the title Baron von Hohenfall by the emperor, which literally means ‘Baron of the Highfall’. This was really the start of the Thirty Years War in Europe, in fact. The Protestant estates decided that they would not be free under Ferdinand, and so would need to elect their own king. They chose a Protestant prince, Frederick V of Palatine, who was the son-in-law of James I of England, and who became known as the Winter King, after his brief period of rule in Bohemia. 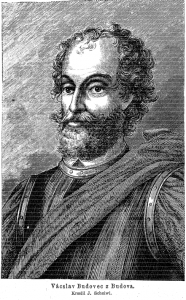 Everything finally came to a head on the 8th of November 1620 when supporters of Ferdinand and supporters of Frederick met in battle at a site named Bílá Hora or The White Mountain. The battle only lasted about an hour, however, Ferdinand’s trained soldiers being no match for the hastily gathered Protestant army. In the chaos, Frederick V slipped out of Prague and fled to the Netherlands (where in fact his descendants went on to become the House of Hanover, making him the ancestor of the British Royal Family). Ferdinand arrested and tried 47 leaders of what was known as ‘The Bohemian Revolt’, and in the end 27 of them were to be executed. One of these men was Budovec of Budova, who had been with the Protestant army at the White Mountain. Budovec had been educated at the Protestant university at Wittenberg and also studied in France and England for twelve years before returning to Bohemia, and had served in the court of both Rudolf II and Matthias. He was a scholar and writer, spoke Arabic and Turkish, thanks to a spell working for the ambassador to Constantinople (modern Istanbul), and even translated parts of the Qur’an. 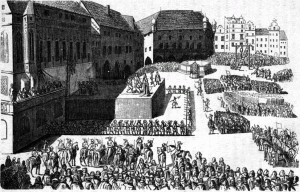 He was, however, always a supporter of the religious freedom of the Protestant faith and had been present at the defenestration, though had tried to dissuade Von Thurn from violence. After the Battle of the White Mountain, he was imprisoned in the White Tower at Prague Castle, and on 21st June 1621, was brought to the Old Town Square where the execution was to take place. 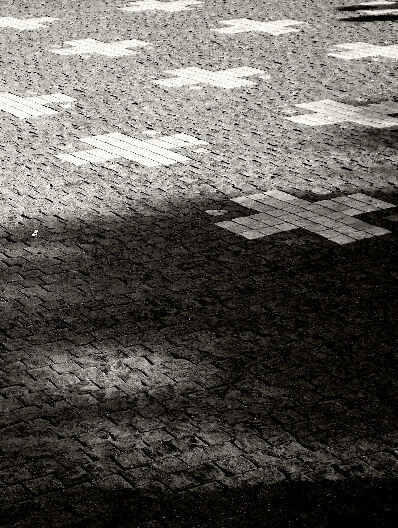 The anniversary of the execution passed a few days ago and wreaths were laid at the site in memory of the victims, but the event is permanently commemorated on the Old Town Square by 27 crosses marked out in the cobbles, one for each of the victims. 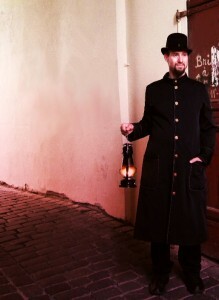 It was known as ‘The Day of Blood’ (you can hear about it on our Ghosts and Legends Tour as well as the Underground Walk by lamplight), and began at 5am, carrying on until around midday, with a massive crowd of onlookers filling the square. This rather gruesome punishment was, however, commuted to beheading just before Budovec was taken from his cell and led to the scaffold. 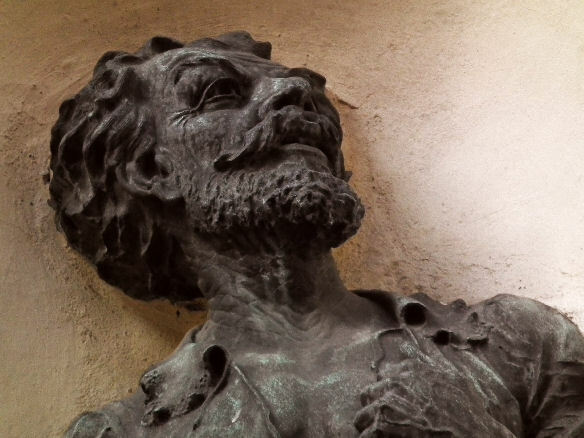 Though attempts were made to persuade Budovec to convert to Catholicism, he apparently stayed resolute and even prayed loudly as he was taken to the scaffold. The executioner Jan Mydlař, whom you can learn about on the Underground Walk, is said to have remarked that Budovec showed no fear as he went to his death. 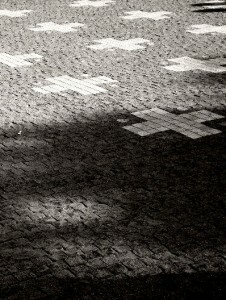 Afterwards, his head was one of 12 taken by Mydlař to the Old Town Bridge Tower at Charles Bridge, on Ferdinand’s orders. These heads were placed in cages and displayed on the ends of spikes as a warning against any further rebellion. Budovec’s head remained there until November 1631, when after more than ten years of decay and humiliation, the remains were finally taken down and reportedly given a proper burial at the Tyn Church, though in fact none of the remains of any of those executed that day in 1621 have ever been located. Back home, Budovec’s wife, Anna, continued to care for the building at Týnská 7 until 1628, when she sold it to Lady Maria of Nageroll. The building itself has been remodelled and repaired over the years, but still has a memorial to its most famous owner.